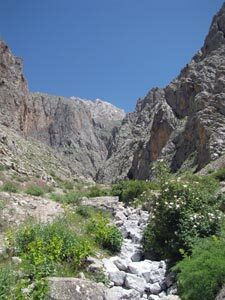 The Ala Dağlar mountains cover about 1000 km2 in the central part of the Taurus Range. 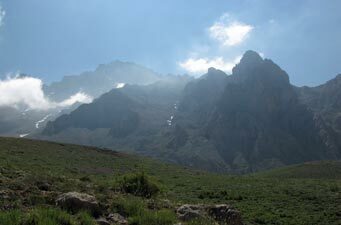 With many peaks above 3000m, they have become well-known for climbing and trekking. 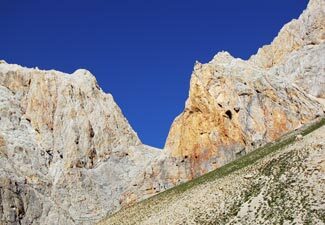 Formed from limestone, these mountains have the typical karst landscape of sheer rock walls and barren peaks that are deeply cut by valleys and canyons. 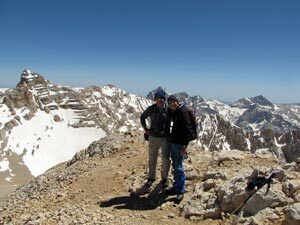 They are clearly a must-visit place for the trekker in Turkey and, after a week walking the gentler paths of Cappadocia's valleys, we were ready to sample the challenges of the less-worn trails of the Taurus Mountains. 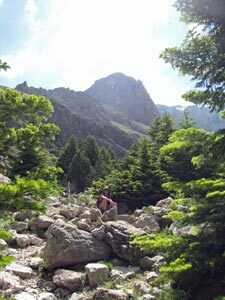 We had to be ready by 8am for our mini-bus transfer from Cavuşin to the Ala Dağlar for the first of our alpine treks in Turkey. 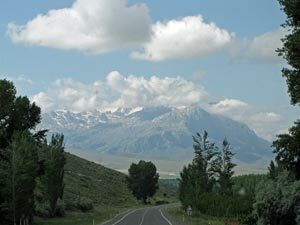 Two hours later we arrived in the little village of Çukurbağ at the base of the snow-capped mountain range. Here we met our guide for the walk, 16 year-old Mehmet armed with a level of English that would enable us to converse and his Turkish-English phrase book. This was a bonus as we had been expecting a guide who spoke no English at all. The teacher instincts in the fair Nello rapidly emerged and before we had even had lunch in the village, cooked by Mehmet’s mother, the first English lesson was underway. Hopefully in return, we might add a few words of Turkish to the dozen or so we struggled to retain over the past 5 weeks, but that would be the harder task. 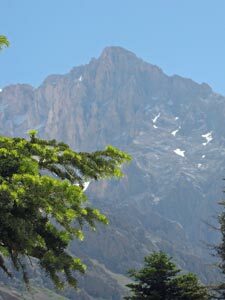 Our plan was to trek for several days in these mountains, based at overnight camps, exploring different parts and eventually crossing the range to its eastern side. Looking up at the cloudy peaks, we were hoping for sun to soften or even melt the snow. 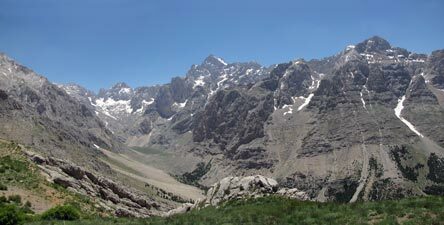 Mehmet said that there had been heavy falls this season and there was a strong risk some of the proposed route might not be feasible. We would find out soon enough. 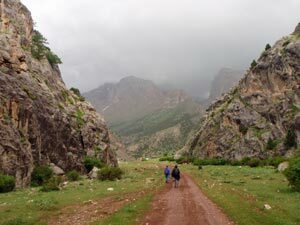 We finally set off from the village of Çukurbağ in the mid-afternoon for the short walk up to our first camp in the Emli Valley. Our guide’s father, Ahmet, took us to the starting point on a dirt road south of the town and then took most of gear up to the campsite by 4WD (this seems to be a family business). Having arrived with clothes and gear for hot and cold weather, camping and swimming etc, we had a lot of baggage, so we were glad that it would travel between campsites by 4WD or mule, as this meant lighter backpacks and easier walking for us. 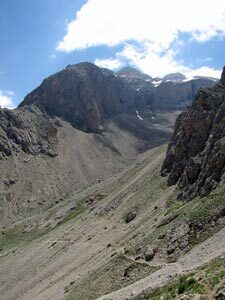 The track followed the edge of a dry plateau, covered with a variety of low herbs, above the Emli Valley. 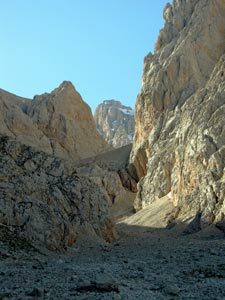 Ahead lay a narrow gap, our entrance to the Taurus Mountains, framed by the rugged peaks behind. 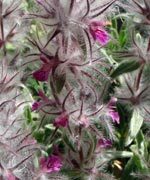 Above were gathering some very dark clouds and, as we descended into the valley on a gravelly footpath, loud peals of thunder began to echo across it. Just as we were entering the gap, it was time to stop and put on wet weather gear. Rain with a dash of light hail had started to fall. 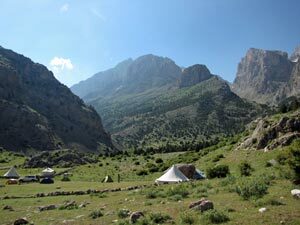 Fortunately, our campsite at Sarimemetler was literally just around the corner, in a beautiful grassy bowl framed by the 3200+m peaks of Cingillibeşik and Iki Bas, their summits hidden in the dark cloud. 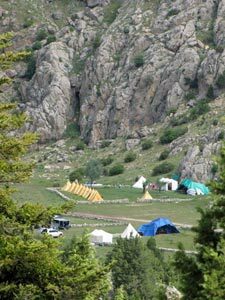 Different areas of the campground, each with their dining and cooking tents permanently in place, were separated out by low stone walls and we headed quickly to our site. It was great to sit under the shelter of the dining tent, with hot coffee and a plateful of Turkish Delight, listening to the rain in this setting – the beauty of rugged mountains, seasoned with a touch of menace. We liked the Ala Dağlar already. That said, we were still keeping our fingers crossed for a fine day tomorrow. 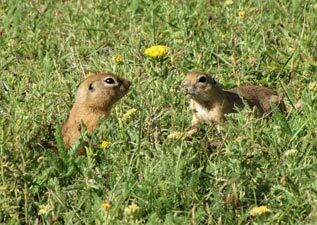 After a night spent listening to the crickets chirping in the grassy meadow, we were woken by the chorus of birds singing in the new day – and what a day it was, barely a cloud in the sky. 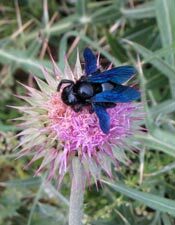 There is no rush to start in Turkey, so breakfast was at 8am, listening to the lazy drone of a bumble bee or oversized fly in the warm morning sunshine. 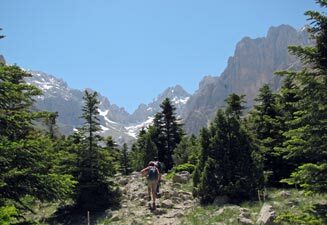 Finally, we set off at 9.30am for a circuit that would take us up to the Alaca Plateau and back. 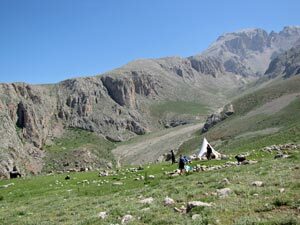 Mehmet led us out of the campsite and across the scrubby meadows. 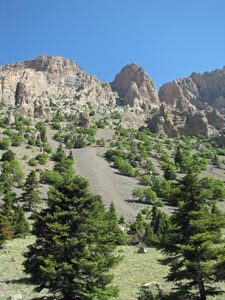 The climb started almost straight away, as we zigzagged up a footpath through scattered and stunted conifers. 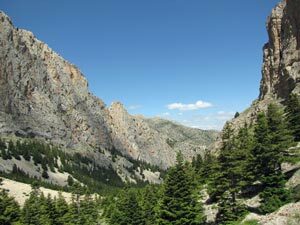 Soon we entered the narrow Büyük Mangirci Valley, guarded by the rocky peaks of Kaletepe to the north and Katir Kayar to the south, where a beautiful forest of cedar and fir was wedged between sheer rock walls on either side. 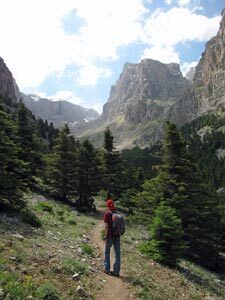 After climbing steadily to the incessant call of a cuckoo, the trees slowly petered out as we reached the head of the valley to cross it on a broad scree slope – ahead the climb up next to the reddish rock wall looked daunting. 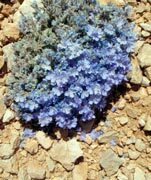 From the scree, two long zig-zags took us steeply up across a stony slope, where grasses and flowering herbs competed for the sparse ground in between the rocks. 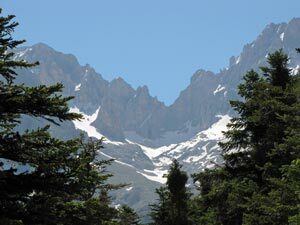 As we ascended, the views opened up behind us over the upper parts of the valley we had just left and the massive form of Eğri Tepe behind it. 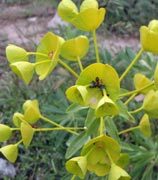 The cool wind at our backs made the climbing easier and a final push directly up brought us out to the grassy saddle of the Alaca Plateau – 700m above our campsite and two hours later. 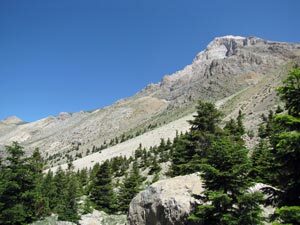 The plateau is a summer grazing area and, from the saddle, we descended a grassy slope to pass through a flock of fat-tailed sheep and head towards the shepherd’s hut. 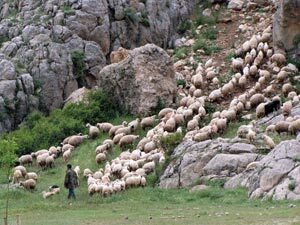 Here we learnt rule no.1 in sheep country – never get between a Turkish sheep dog and his flock! 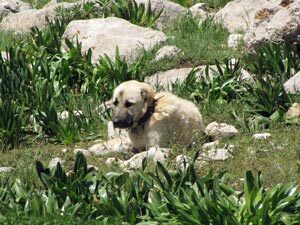 The two dogs gave us a very vocal and teeth-bared greeting, but the shepherd emerged from his hut and calmed them down. After this they decided it was just best to sit and keep an eye on us to make sure we didn’t go back anywhere near their charges. With a cold spring of water and some shady rocks, it was a good place for lunch. When we were finished eating, the shepherd brought out a teapot for a cuppa, Turkish style – very pleasant. Go near my sheep and I'll tear your arms off!! 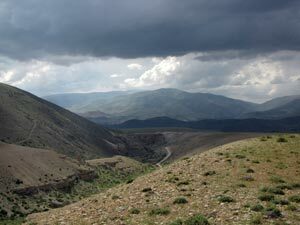 Lunch over, we headed off across the stark landscape of the plateau, backed by the barren rocky slopes of the mountains. 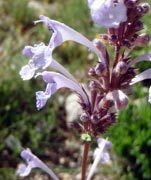 Descending to cross the steep ravine of the upper Küçük Mangirci Valley, we climbed back up to the plateau with its spectacular wildflowers in varying shades of white, pink, blue and yellow, before starting our long and final descent – 700m down. Our knees cringed at the prospect and it was clear that Dr Voltaren would have some patients tonight. The path descended steeply to a point where we could see directly up the Emli Valley (our route tomorrow) and out across the countryside beyond the mountains. 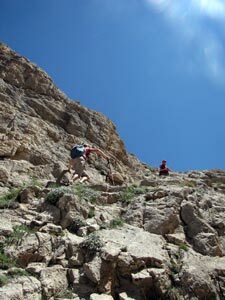 From this point, the descent became even more steep, as we picked our way directly down a rock-jumbled corridor where we caught up with a group of North American / European / Australian trekkers. 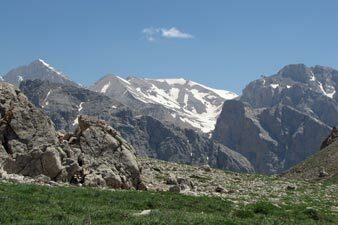 From here, it was across a boulder-strewn slope to reach the grassy meadows of the Oluk Sekisi Yayla – time to lie in the grass, compare notes on trekking in Turkey with the group, and simply contemplate the beauty of our surrounds. While stopped the fair Nello's mothering instincts got another workout - our young guide had outgrown his boots of the previous year and given himself a set of badly bruised toes - so it was out with our first aid kit for some podiatric TLC before setting off on the last leg. From our grassy vantage point we could see the cliff-line above our campsite way below. 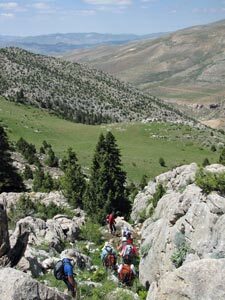 Another steep descent, but this time on a winding footpath brought us back to the campsite, tired but full of great impressions of our first walk in the Taurus Mountains. It hadn’t been a long trek, but, as in all mountains, height gained and lost is the measure of a walk. 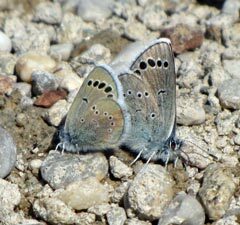 We were back early enough to relax in the late afternoon sun, watching the brilliant blue butterflies flit about the spring and the cheeky ground-squirrels cavort on the grassy campsite ( memo to self; watch out for their burrows when heading to the toilet in the dark). After a hearty meal cooked up by Ahmet, he and Mehmet headed back down to the village for the night, leaving us alone to enjoy the solitude of this beautiful site. 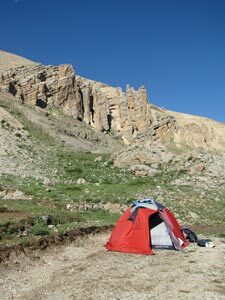 By walking in June, we were definitely ahead of the crowds - one big advantage of this was that we snaffled an extra foam mattress each, crawled into our tent and fell comfortably asleep to the sound of the crickets of the Ala Dağlar. After another cool night in Emli Valley, we awoke to a cloudless blue sky. By the time the sun reached our tent at 7.30 am, it had already warmed up and, after packing up our gear, we were ready to set off. 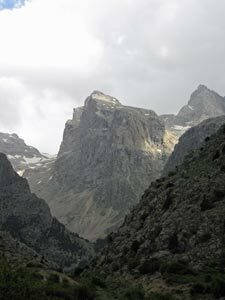 Today, we would leave Emli and walk over the range to Sokullupinar campsite on the western flank of the Ala Dağlar, while our gear was transported via the valley to be waiting for us when we got there. 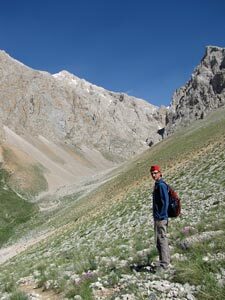 Once ready, we set off with Mehmet up the gravel road that headed deeper into the Emli Valley. After rounding the first slight bend we were surrounded by the mountains. 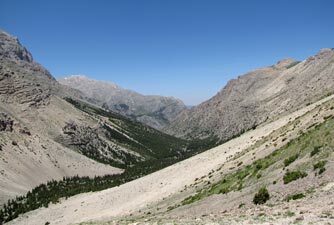 Thus commenced a rolling panorama of alpine scenery, the cypress and fir-clad valley sloping up on either side of the road, slowly changing into barren scree that butted up to the immense rock walls of the ranges that enclosed it. On the road, we gained height while barely noticing it, but as the valley curved around, the road ended and we switched to a footpath that continued the upward trend though the conifers, lime-tipped with fresh new growth. 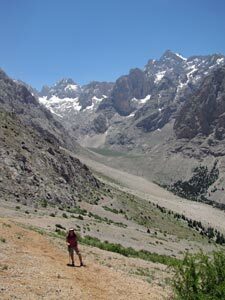 Ahead lay the head of the valley backed by the magnificent Güzeller peaks. 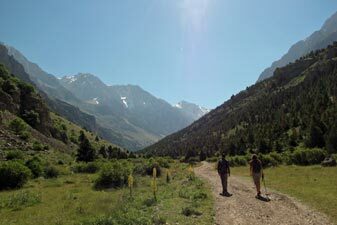 We were trying to work out the route out of the valley, when we left the forest behind to enter an area of rocky scree. 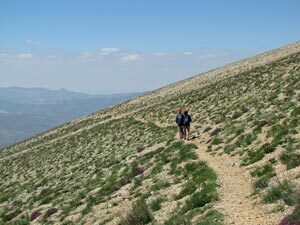 Here, Mehmet took a short cut across the scree to find a faint track heading back up the valley wall in the opposite direction – it was the start of a long and steady ascent , angling across the loose scree with its sparse covering of low grasses and herbs. 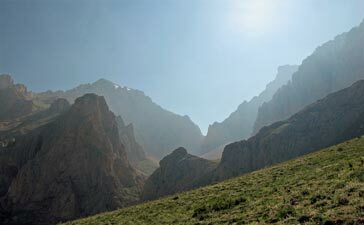 As we climbed, the views opened up down Emli Valley, while further peaks beyond it began to show their tops. 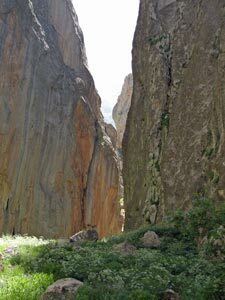 Our aim was a gap in the rock walls that brought us up on to the grassy pastures of Eznevit Plateau. On the edge of the plateau, we stopped to take in the magnificent sweeping panorama of the peaks lining the far side of the Emli Valley, Güzeller, Istanbul Tepe and Kaldi – breathtaking!. We finally turned way to climb gently through the pastures, deviating slightly to go around the back of a flock of grazing sheep and avoid upsetting their guardian dogs. 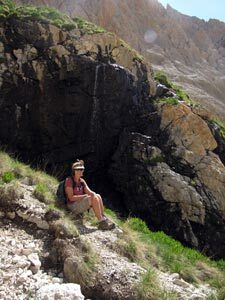 A bit more climbing and we reached the high point of our walk at 2500m, a good place for lunch beneath the colourful rock face of Karasay Mountain. 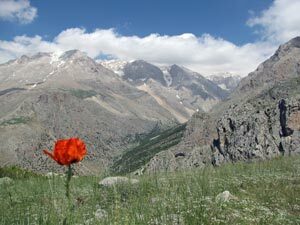 From its base, the western flank of the Ala Dağlar swept down to the plain beyond in a barren expanse of gravelly orange-tan scree. After lunch, we put on our fleeces - the wind that had been our friend on the ascent had become our enemy on this high exposed slope. 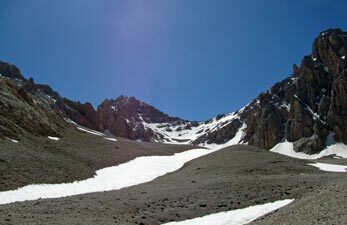 With a cold wind in our face and the sun on our backs we headed northward to traverse this long section of scree, almost bare, with a scattering of low flowering herbs and grasses. To our right the mountains filed past, while to our left we could look way out over the plain and beyond to more distant snow-capped peaks. Finally, we reached a dry ravine cutting into the broad mountain flank and descended quickly down it on a loose stony path. 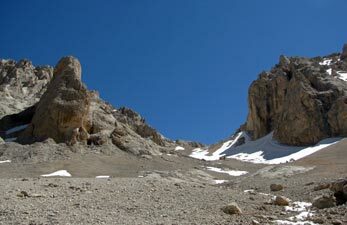 The path joined a gravel road and this brought us to the upper camp of Sokullupinar set beneath the masive rock pyramid of Demirkazik Peak. 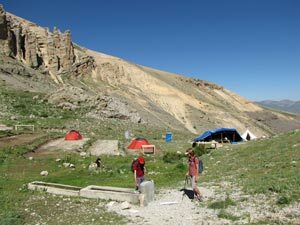 It was a somewhat more spartan place to spend the nights than Emli, but with friendly staff – a plate of biscuits, Turkish delight and a hot coffee were ready and waiting for our arrival. The campsite itself was busy - Mehmet joined his father and other workmen, busy levelling out tent platforms and stitching together a cover for a new dining tent. 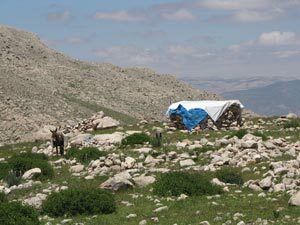 In the corner, a large number of small tents were waiting to be erected. This scene was being repeated further down the valley at other campsites, so clearly a large influx of walkers and climbers was about to arrive. We were glad to be that bit ahead of the crowd. However, we were not totally alone. That evening, we met a few more trekkers – Martin from Germany, who was mapping the routes of the Ala Dağlar for his Masters degree in cartography, and three Turkish trekkers who had just completed a 13 hour ascent and descent of 3723m Emler Peak. 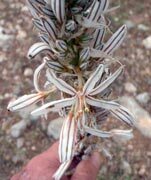 It was good to socialise a bit in the dining tent, high above the twinkling lights of the villages on the plains below, and learn more about these mountains and the climb up Emler - in two days we hoped to be doing it ourselves. The procession of blue sky mornings continued, as we set out on our third walk in the mountains of the Ala Dağlar. Today would be a bit of a reversal of the normal pattern, with an initial descent followed by a climb – we were off to the Cimbar Canyon. 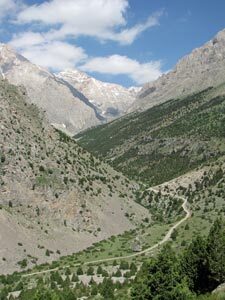 Leaving the camp, we followed the road quickly down to the other encampments of Sokullupinar, some 100m lower down in the Yalak Valley, before climbing back up on a road heading north across the western flank of the mountains. 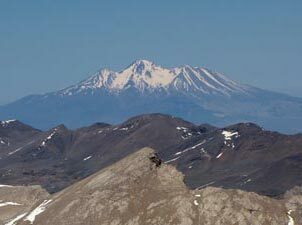 The silhouette of 3756m Demirkazik, backlit by the sun, set a mysterious mood to the morning. 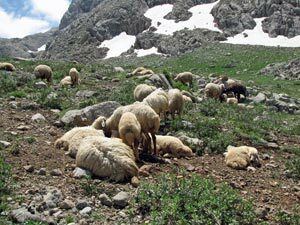 After a short climb, we reached the green carpet of Arpalik Pastures, home to two summer sheep-grazing camps. 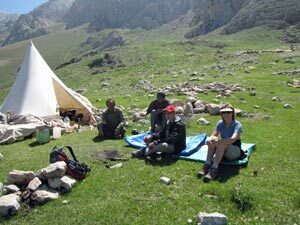 The shepherds were sitting in one of the tents and invited us in for a cup of çay and chat (with Mehmet). 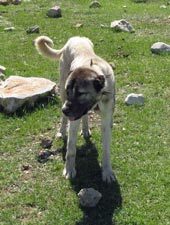 The big spike-collared kangal dogs, following the lead of their masters, decided to tolerate our presence. It was a pleasant way to have a morning cuppa sitting in the green pastures beneath the impressive face of Demirkazik. 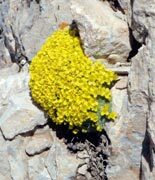 However, an even more impressive sight awaited us, for dropping off steeply from Arpalik Pasture lay the head of Cimbar Canyon. 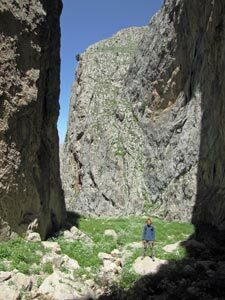 We headed down a loose stony track to reach it, a semi-circle of tall rock walls that narrowed into a slot only a few metres wide. 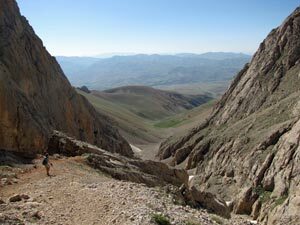 It was our passage to the valley below – welcome to Cimbar Canyon. The winding track dropped quickly with a lot of rock-scrambling to pass through the narrow entrance and reach a wider grassy bowl. 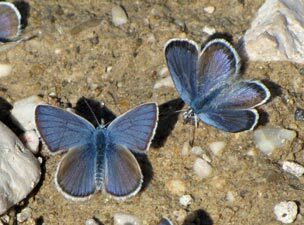 The walls of the canyon were home to tiny swallows and the floor to even smaller rock wrens, while the sounds of choughs soaring across the canyon heights echoed from its walls. 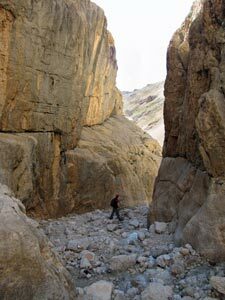 The track dropped even more steeply from this upper canyon into a rugged lower one, where once again the walls narrowed. 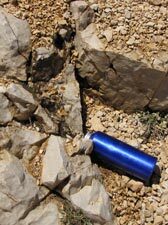 This was mountain goat country, but if any there were watching us they were very discrete. We picked our way slowly down until, rounding one curve in the rock walls, we could see the plains beyond. A little later, the canyon spilled out onto the plain, 750m below its starting point, to meet a sealed road which passed its mouth. We followed the road for a while before turning off just after a winter sports complex to head back up to Sokullupinar campsite on the gravel access road. We thought this might have been a boring section, but with the full length of the range on one side and the expansive views over the plain on the other it was far from that. 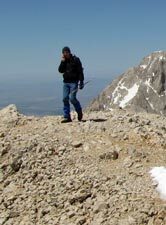 The only problem was that Mehmet was still having problems with his feet – he had outgrown his walking boots and this had caused toe problems the first day we walked. He then switched to sneakers, but their soft soles were no match for the sharp karst rocks of the canyon floor, so his soles were duly bruised. 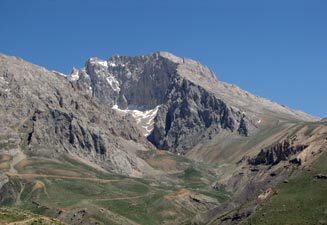 Soon after starting the climb, he phoned his father Ahmet, who was working up the campsite. 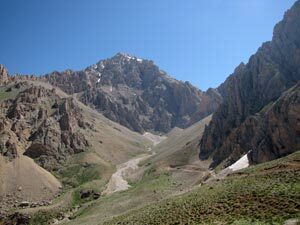 Thus, with a couple of kilometres of the circuit to go, Ahmet was waiting to pick us up in his 4WD. I don’t like not finishing walks, but what the heck – as we have learnt several time here in Turkey, you just go with the flow. 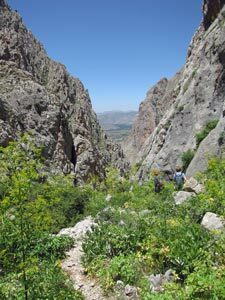 The canyon walk showed us another facet of the Ala Dağlar Mountains and the early return gave a bit more time to rest up – tomorrow would be the big day of our time here and we would need every bit of energy that we had in reserve. It was time to tuck in to the Turkish delight. 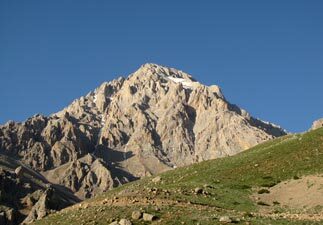 Our fifth day of trekking in the Ala Dağlar was the one that we had been building up to – the ascent of 3728m Mount Emler. 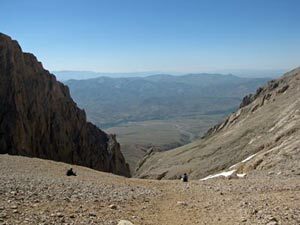 Originally, the plan had been to climb the mountain and then go down onto the eastern side of the range and camp on the high, lake-dotted plateau of Yedigoller, some 700m below. 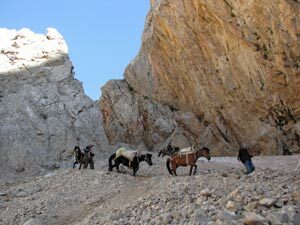 However, because of the heavy late snows, which made it difficult for horses and mules, the campsite had not yet been set up and we were left with no alternative but to return to Sokullupinar campsite from where we would start. This made for a total climb and descent of 3200m – a pretty big effort for most people, let alone a pair of old farts like us. 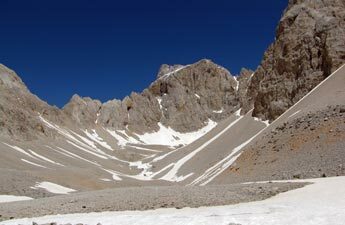 It was a perfect day for such an effort, though, as the intensely blue cloudless sky that greeted us in the morning promised incredible views from the heights of Emler, should we get there. It was a strong incentive. 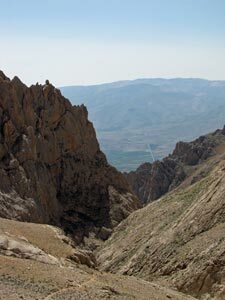 We set off just after 7.30am and the morning shadows were still long across the western flank of the mountains, as we headed quickly southwards up the ravine above Sokullupinar. The fair Nello was the first to see it – a sudden movement high above us, something disappearing behind a rise, then reappearing. 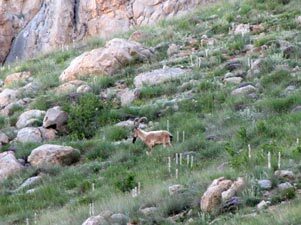 The mountain goat bounded across the slope, stopping briefly to show us its backward-curving horns and then disappeared from view. 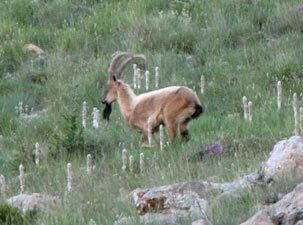 It was a rare and exciting sight in the Turkish mountains and left us thinking that the omens for the day were good. 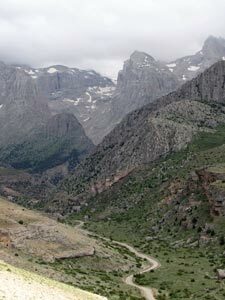 The Karakaya Ravine curved around to cut into the mountainside and we followed a rough rocky path up to its seemingly dead end. 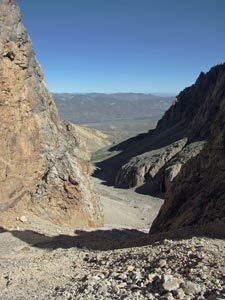 As we reached it, we could see that a narrow corridor opened up to the right and a loose scree track zig-zagged its way steeply upwards – it was the gateway to Emler Mountain. 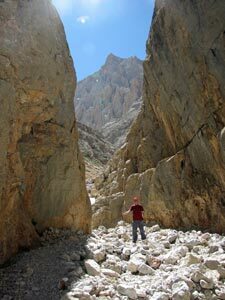 We would need to get used to the sharp karst scree, as most of our climbing from now on would be on it, varying from loose and fine pebbly stuff to larger, razor-edged rocky stuff, none of which would do the soles of our boots much good. Once we reached the top of the rock corridor, passing our first snow drifts of the day, the climb continued up a long rocky scree slope, before an even steeper ascent of a loose pebbly scree slope where every step forward is dragged that little bit backwards as the loose pebbles give way and slide – frustrating and energy sapping! 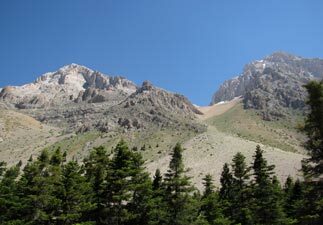 Once we crested this slope, we found ourselves in a broad basin, locked in by immense grey and orange-tinted cliffs, as the path took us relentlessly upwards toward a snowy bowl beneath the dark pyramidal shape of Kizilkaya, at 3767m the highest peak in the Ala Dağlar. 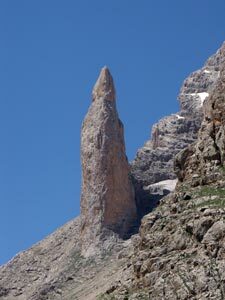 The only way to handle such an unyielding climb is to set goals - 350m in the first hour, 500m of climb done, 2 hours done, past the 3000m contour, 1000m of climb done etc etc. As the Turkish say, “yavas, yavas” slowly , slowly. Reaching the head of this broad and barren scree basin, where only a few pink and yellow-flowering prostrate herbs added a splash of colour, we stopped at a large boulder that the locals call “Have a Rest Rock” – it seemed a very good idea, as ahead of us lay an even steeper section of very loose scree with the odd snowdrift to cross as well. It was a slow haul up, but as we got higher the cool wind started breaking through over the ridge above us – a welcome relief for our climb. 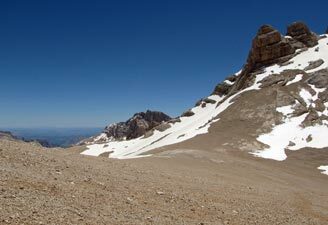 Reaching the crest at 3500m, we found ourselves above the pass leading to the Yedigoller Plateau and looking down onto the broad expanse of barren, dimpled terrain, dappled with snowdrifts, that is Yedigoller. To our left the scree field continued upwards, directing our attention to a longish ridge that formed the summit of Emler, now only a few hundred metres above us. 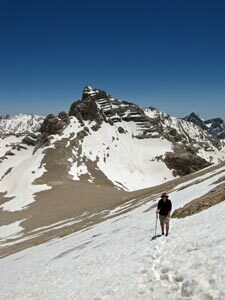 The ascent from here, though technically easy, became a hard slog up sliding scree and across soft wet snowdrifts. 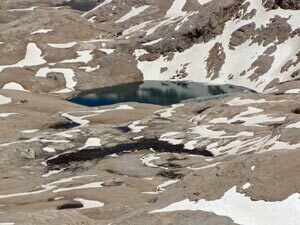 We passed several tiny snow-fed springs, where water trickled out of the scree slope, stopping at one of these to top up our water-bottles - a 1600m climb uses up a lot of fluids and water at this altitude is at a premium. 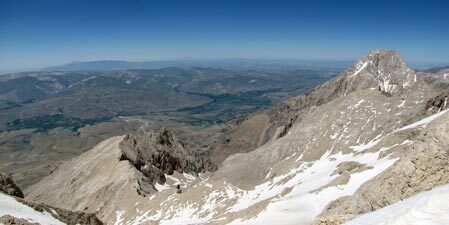 As we climbed, the views below over Yedigoller broadened to reveal one by one its numerous lakes of varying size. 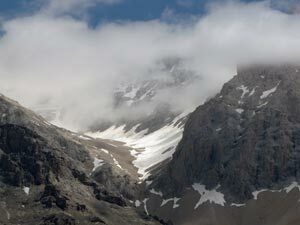 The wind was now quite cold and at 3700m, we declared a lunch break at a sheltered spot just below the summit ridge. 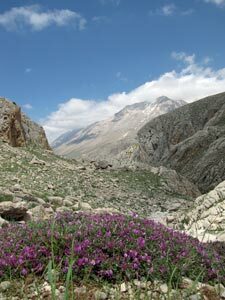 From here the views were simply magnificent – looking way down on the ravines of the western flank of Ala Dağlar, across to the massive dome of Demirkazik and the distant cone of Erciyes volcano, out over the snow-dappled plateau of Yedigoller and distant snow-tipped massifs beyond, and across the pass to Kizilkaya, the highest peak of the Ala Dağlar – almost 360° of rugged alpine landscape. Only the summit itself blocked the full circle, so with lunch over, we put on our beanies and fleeces to keep out the wind and climbed the final 40m to the summit, to take in all the views once again. Mehmet was so excited, he pulled out his mobile phone to call all his mates (mobile reception in Turkey is amazingly good). Our time at the top over, it was time to head down again, all 1600m down. 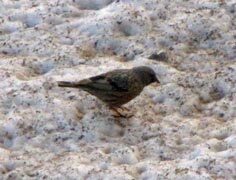 It was a much quicker journey – as scree and snowdrifts became our allies. 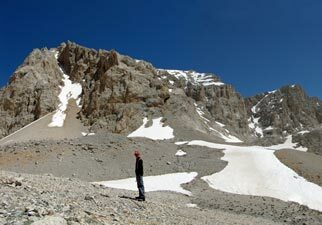 We took the direct route down the deep scree slopes – descending them was like walking down a moving escalator with piles of loose stones rattling down at each step. A bit of boot-sliding down the steeper snowdrifts also sped up the descent. However, scree is hard on the feet, and by the time we finally made it back to camp 10 hours after setting out, we were footsore and weary and very, very happy. No pain could take away the elation of having climbed Emler and finished arguably the hardest day-walk we have undertaken. The cook was waiting for us with Turkish Delight and hot çay, but where oh where was that cold glass of Efes to celebrate the day. 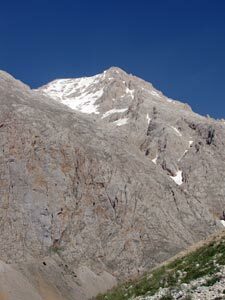 It was a pity that we couldn't have pushed on to Yedigoller from Mt Emler - we had been overtaken on the way down by workers and pack mules who had spent the day up there setting up the campsite and by next week it would be operational. Such is life! We did however get a reward for our efforts. 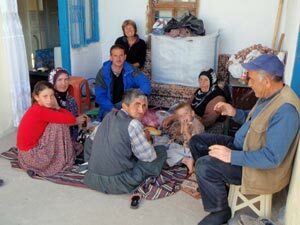 Ahmet invited us to go down to the village to stay in the family pension – a hot shower, dinner and bed in a house instead of a tent. We slept very well that night. 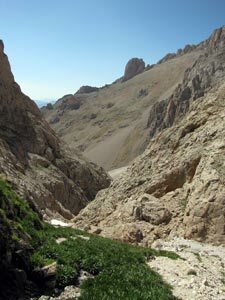 The western flank of the Ala Dağlar is cut by a number of deep ravines, such as the route up to Emler and the Cimbar Canyon. 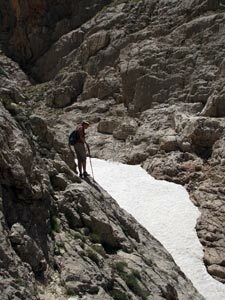 As we were stuck on this side due to the late snow in Yedigoller and could not do the planned walking there, Mehmet decided to guide us into another of these ravines near the campsite - one that led to a pair of high valleys known as Narpuz 1 and Narpuz 2. What made the walk interesting was that it was not one that many foreign trekkers get a chance to do. We had a late start, after returning to the campsite from our night in the village. 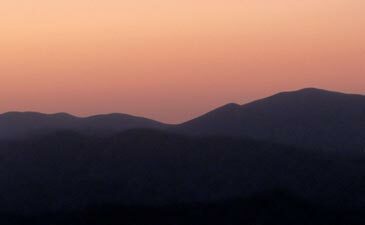 Yet again, the sky was cloud-free as we headed off, thinking that a light cool-down walk would be very nice. 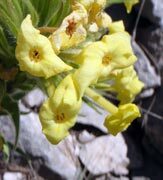 It seemed that way initially, as we climbed gently up a gravel road and over a humped spur to descend toward the small valley of Narpuz 1. On the way, Mehmet’s English lessons continued, as the fair Nello reverted to teacher mode. Once we reached the dry stream bed, we could look up into the head of the valley –the stony track seemed to stop at an immense rock wall. 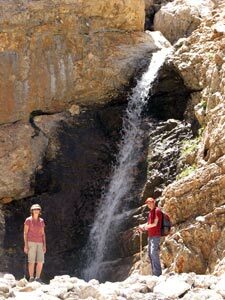 However, as for the Emler climb, when we reached the cliffs, a narrow gap emerged to the right and through it flowed a babbling stream that quickly disappeared underground in the rocky stream bed below. We followed the clear rushing meltwaters up into this gorge, picking our way along the rockface or hopping from boulder to boulder in the stream as it tumbled down from higher up. Snowdrifts still hung about in the shady part of the stream bed. We skirted these, but eventually the channel was blocked by a 6m waterfall, forcing us to leave it and start heading up the rocky side-walls. 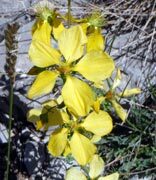 This was mountain-goat country and we were obliged to use hands as well as feet to climb up the steep rock – my exposure meter entered the yellow zone on a couple of narrow ledges, but we eventually descended back to the stream bed higher up and pressed on. 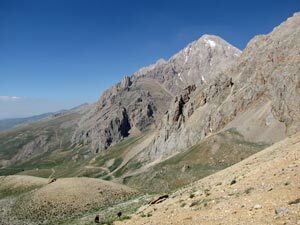 Climbing up a loose scree slope, we reached the high valley of Narpuz 2, surrounded by grey orange-tinted rock walls on both sides - 3767m Demirkazik to the left and 3330m Bozkaya to the right. Our cool-down walk had turned into a 700m climb, so we stopped for lunch in the little bit of shade offered by a large boulder. The fair Nello decided this was a good place for a siesta, so Mehmet and I pushed on to a ridge a further 200m higher to get a grand overview of this arid high valley and the mountains that contained it. Then it was time to descend – one more chance to boot-slide down a snowdrift, collect Sleeping Beauty at the lunch-spot boulder and head back down. 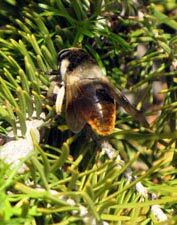 While we were away, she had discovered the remains of a mountain goat (6-years old from the rings on its horns, according to Mehmet) that had clearly been torn apart and devoured by something quite large. The shepherds say that wolves still live in the mountains. On the descent we avoided the more aerial parts of the rock scramble that we had on the way up, by sticking closer to the stream. Once through the gap, it was a long trudge home in the hot afternoon sun. 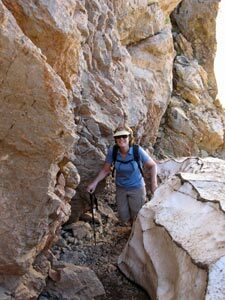 The walk up a narrow stream bed and rock climb out of it added to the variety of landscapes that we had seen. 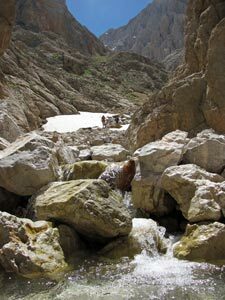 While disappointed not to have walked to the eastern side of the mountains and visited the Kapuzbaşı Waterfalls, we had greatly enjoyed our time in the Ala Dağlar. 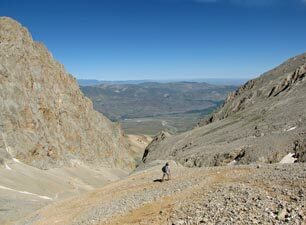 Nonetheless, our feet were happy that it was our last walk – six days spent largely walking on scree of varying size and thickness had left them in need of a few days rest before heading on to the Kaçkar Mountains. That evening we shared a last mountain dinner with Mehmet the guide, Mehmet the cook and one of the shepherds who had dropped in with his flock of sheep and goats. 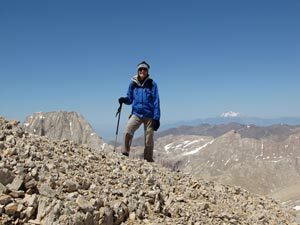 It was an interesting comparison of the old way of life (shepherding) with the new (adventure tourism) – for the moment they seem to coexist happily, but each year more and more walkers and climbers come to these mountains. 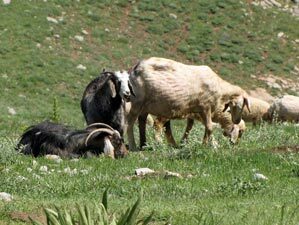 Will the old way of life in the mountains survive? The next morning we headed down to Çukurbağ for a quick shower and change of clothes at Ahmet's house. 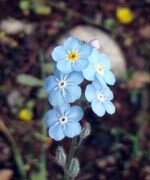 Then, after farewelling him and his family, we were off by bus to the big smoke of Kayseri for a couple of days to catch up on laundry, shopping for supplies and correspondence. It was a break our feet enjoyed (and needed) before our next lot of trekking in the Kaçkars.